638 pages | 97 Color Illus. | 459 B/W Illus. 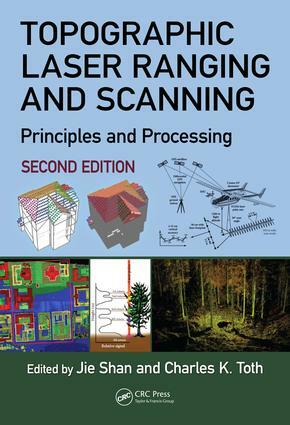 Topographic Laser Ranging and Scanning, Second Edition, provides a comprehensive discussion of topographic LiDAR principles, systems, data acquisition, and data processing techniques. This edition presents an introduction and summary of various LiDAR systems and their principles and addresses the operational principles of the different components and ranging methods of LiDAR systems. It discusses the subsequent geometric processing of LiDAR data, with particular attention to quality, accuracy, and meeting standards and addresses the theories and practices of information extraction from LiDAR data, including terrain surface generation, forest inventory, orthoimage generation, building reconstruction, and road extraction. Written by leaders in the field, this comprehensive compilation is a must-have reference book for senior undergraduate and graduate students majoring or working in diverse disciplines, such as geomatics, geodesy, natural resources, urban planning, computer vision, and computer graphics. It is also vital resource for researchers who are interested in developing new methods and need in-depth knowledge of laser scanning and data processing and other professionals may gain the same from the broad topics addressed in this book. A comprehensive array of new laser ranging and scanning technologies. Developments in LiDAR data format and processing techniques. Regrouping of surface modeling, representations and reconstruction. Enhanced discussions on the principles and fundamentals beyond small-footprint pulsed laser systems and new application examples. Many new examples and illustrations. "This book is a must-have resource for students, educators and users of LiDAR data. Comprehensive in scope and newly updated, the book is a key reference for all aspects of LiDAR. This masterful compilation, written by the leaders in the field, captures the latest developments in the rapidly growing field of laser ranging and scanning." "With the significant recent developments in LiDAR technology, such as single-photon and Geiger-mode LiDAR, the publication of this substantially updated Second Edition is a welcome addition to the geomatics literature. Descriptions of applications have been expanded to cover recent technological developments such as integrated mobile mapping systems and sensors mounted upon unmanned aerial systems, with there also being expanded coverage of automated feature extraction, 3D building extraction and modelling, and the application of LiDAR for forest inventory and management. The comprehensiveness of this book makes it an ideal textbook, as well as a valuable reference source for university students, researchers and practitioners of LiDAR technology." "There are few in-depth references on this important source of geospatial data, and this text fills an important void. While one can find many articles in scientific journals, there is no comprehensive treatment of the subject equal to that found in this book. It will be a seminal resource for new professionals entering the field and for seasoned professionals seeking to keep their knowledge current. As a remote sensing educator at a leading university, I consider this publication to be an essential addition to the library of any serious student or practitioner in the geospatial field." "This second edition of Topographic Laser Ranging and Scanning (2009) arrives none too soon, as the pace of innovation and accelerated use of LiDAR instruments has rapidly expanded into new applications areas. The nine chapters, written by recognized leaders in the field, covers a full range of Lidar systems, including strategic revisions and updates to accommodate new applications and capabilities. This volume, like its predecessor, provides ample graphics, carefully tailored to clearly illustrate key concepts presented by the text. This edition is valuable as an authoritative text, assessable to students, but also as an important reference for practitioners, scientists, and faculty. It is effectively organized, concise, and clearly presented with ample references, forming a valuable asset to prepare analysts in all aspects of Lidar systems." "Since the publication of the 1st edition, this book is one of top LiDAR references for research and teaching. Thus, the 2nd edition is highly welcomed to keep its readers and followers updated with the most recent technologies in this fascinating field. …the book gives an excellent overview of the state-of-the art of data collection and data processing. It is recommended to all students, academics and practitioners dealing with LiDAR technologies and its applications." "This second edition of the book offers comprehensive coverage of principles, technology and applications, like its predecessor. About half of the 19 chapters have been amply expanded and improved to cover recent developments like lidars based on single-photon avalanche detectors (SPADs), integrated mobile mapping, 3-D measurements on buildings, developments of lidar data processing techniques, and remote sensing of forest inventory." Jie Shan received his PhD in photogrammetry and remote sensing from Wuhan University, China. Since then he has worked as faculty at universities in China, Sweden, and the United States, and has been a research fellow in Germany. Currently, he is an associate professor in geomatics engineering at the school of Civil Engineering of Purdue University, West Lafayette, Indiana, where he teaches subjects in photogrammetry and remote sensing, and geospatial information science and technology. His research interests are digital mapping, geospatial data mining, and urban modeling. He is a recipient of multiple academic awards and author/coauthor of over 100 scientific papers. Charles K. Toth has PhDs in electrical engineering and geoinformation science from the University of Budapest, Budapest, Hungary, and is currently a senior research scientist with the Ohio State University Center for Mapping. His research expertise covers broad areas of 2D/3D signal processing, spatial information systems, airborne imaging, surface extraction and modeling, integrating and calibrating of multisensor systems, multisensory geospatial data acquisition systems, and mobile mapping technology. His references are represented by over 150 scientific/technical papers.